The Fiat 130 is among our favorite 1970s coupes: they were styled along the same lines as the Lancia Gamma and Ferrari 365 GT4 2+2, and much later the Bitter SC. That is to say they are boxy and very likely designed by the same folks at Pininfarina as the Lancia and Ferrari. They are also manly in an Italian Job or Steve McQueen kind of way, although McQueen could handily afford the Modena version. 130s – both coupes and sedans – are very rare Stateside, but can be found in varying states of repair on the continent. We happened across this example, which the seller reports is mechanically sorted but clearly needs at least a little interior help, while trolling mobile.de. 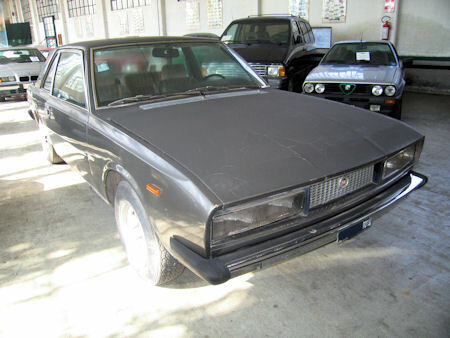 The fact that it is an Italian car for sale in Italy (Turin, to be exact) by Italians makes it all the more appealing. As it stands, even with shipping this car could be a deal for the right buyer at €3,367, or about $4,400.